Road debris, scattered remnants including substances, materials and other objects that are foreign to the normal roadways, are serious hazards for drivers. Debris is produced by vehicles or vehicle parts, such as tires, or it can result from items falling off vehicles as they travel down the roadway. They can also come from sources other than vehicles, and can include animals, rocks, or litter left on the roadway. Regardless of the source of the debris, it is a hazard that can cause accidents as drivers attempt to avoid the item. Debris can also cause accidents when it hits a car and causes damage, such as if it cracks or shatters a windshield. If you or a loved one has been involved in an accident due to debris, you are likely to need the legal assistance of a personal injury attorney. Frankl & Kominsky is a highly experienced and trusted firm in South Florida, that has represented numerous victims of accidents caused by debris, fighting insurance companies and negligent drivers for the compensation they deserve. How Serious a Problem is Road Debris? A 2016 research study by the AAA Foundation for Traffic Safety found that road debris is a serious factor in car accidents. That study reported that "vehicle parts, cargo, or other material that has been unintentionally discharged from vehicles onto the roadway is estimated to cause over 25,000 crashes per year in North America." The same study found that debris causes about 500 fatalities per year. From 2011 to 2014, road debris caused 39,000 injuries. 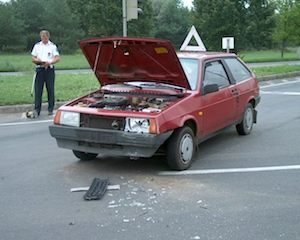 According to AAA, many crashes caused by debris can be avoided. The report says that if vehicles secure their cargo loads properly and if they report any debris on the road, there is much less chance of causing an accident. The most prevalent forms of debris on the road include tire treads, garbage from waste haulers, lumber, and construction materials which have fallen off trucks. However, the AAA report also found furniture, boat trailers, branches, and even swing sets on roadways. Debris is more common on highways and interstates than on smaller roads. Although the individual who created the road debris may be legally liable for any accidents, it can be difficult to determine who is responsible for the problem. For example, trucks that drop parts of their load may have left the scene hours before a crash takes place. At Frankl & Kominsky, we know there are other legal routs, such as uninsured motorist claims, for victims of crashes caused by road debris to gain compensation. Frankl & Kominsky is also adept at dealing with insurance companies seeking to limit damages they pay out regarding road debris cases. Our passionate and assertive legal teams work not only to identify those responsible, but also to hold them accountable, and to get victims the compensation they deserve. If you or a loved one in South Florida has suffered in a car accident caused by road debris, you may be entitled to compensation. Frankl & Kominsky will review your individual situation and help you understand your options. For a free consultation, call us today at (855) 800-8000 or fill out our online form. Frankl & Kominsky serves clients in South Florida communities such as Pompano Beach, Lake Worth, Boca Raton, Boynton Beach, Delray Beach, and Palm Beach Gardens. We are fluent in Spanish and Creole.